The Public Peace Prize is the only peace award in the world for which the candidates are proposed, nominated and supported simply by citizens of the world. This mark of recognition allows everyone to offer their appreciation for initiatives and for people, known or unknown, who are working for reconciliation, non-violence and mutual aid. How can we propose a candidature? New propositions of candidates will be automatically signed up for the 2018 edition of the Public Peace Prize. 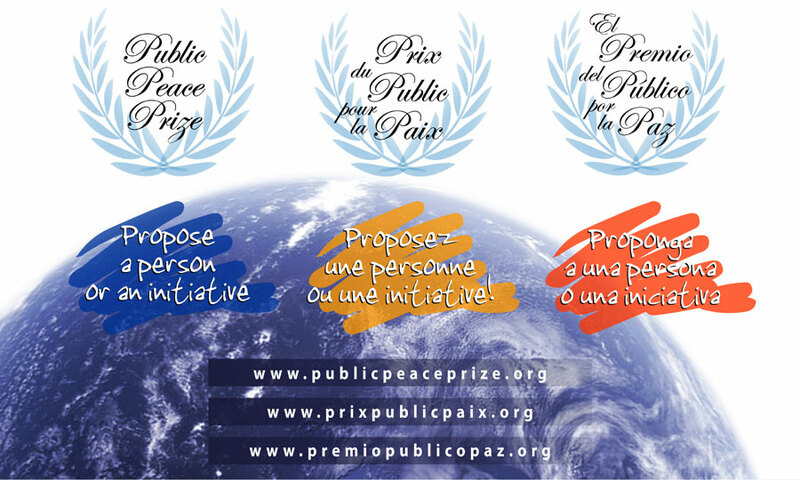 Anyone can propose and person or a peace initiative at the email address contact@publicpeaceprize.org by following three steps. Any person, group or initiative that contributes to bringing a little more tolerance, understanding, mutual aid, solidarity, inclusion, reconciliation, non-violence or peace to the world is eligible! Ask ten other people to write letters of support for the candidate (minimum 10 lines of text each) and send them by email to contact@publicpeaceprize.org. Pull together a team to network and encourage voting for the person or initiative when the voting period is open to the public (see details on our website). Candidates or initiatives who did not win the previous year are automatically re-nominated and eligible for voting during the following year. The initiatives or candidates who receive a significant amount of support in their category will be proclaimed the laureate of this category. The PPP team reserves the right to create categories in line with the candidatures proposed in order to maximise the recognition of the diversity of actions for peace. The number of visits to the pages presenting peace initiatives and candidates will also be taken into consideration as an indication of the public’s appreciation. Just a reminder that the sole objective of the Public Peace Prize is to make better known as many peacemakers, peace projects and peace initiatives as possible to a large audience, beyond all forms of competition! The Public Peace Prize is not a cash prize but a prize of public recognition. Just like last year, the Public Peace Prize remains a completely unconditional prize, without grants or sponsors, organized by simple volunteer citizens of the world, with the goal of fostering recognition of peacemakers and peace initiatives beyond the boundaries of culture, religion, and social affiliations! All non-profit organizations can become partners of the prize by associating with the team to help make the prize better known through their own networks. Like our Facebook page or sign up on our website to stay informed of all the details. I want to support the nomination of Father Michael Lapsley. Your form does not tell me clearly how I can do this. Suffice it to say: in his response to thef the cruelty imposed on him by the letter bomb of the SA apartheid police, he has identified with numerous other victims of that unjust order, and he has taken seriously the damage done by apartheid to both the victims and the perpetrators of that violent system. He is an exemplar of the power of forgiveness in policxs, and the substitution of compasson for the ravages of hate in national and world society. I support the nomination of Marie Dennis for this Peace Prize. I have worked with Marie over many years and her gentle spirit and deep faith had modeled for me the patience that it takes to invite peace to become a reality in various situations, from in house swabbles to global conflicts. Peace is her middle name, one may say, and she had committed her whole life to sharing that with others. I wholeheartedly support the nomination of Marie Dennis for the Public Peace Prize. She brings a strength and commitment to the work of peacemaking that is an example and support for all of us. Marie and the other nominees provide us all with hope for the future of our world. I wholeheartedly endorse Marie Dennis for the Public Peace Prize. She embodies an authentic, true and encompassing model of and for peace for each precious living soul. I want to support the nomination whole-heartedly to Yoga Master and Jal Yoga Founder Dharmendraji (Dharmendra Ratan Singh Sailoni) from Mumbai, India, for the Public Peace Prize Award-2017. I know Master Dharmendraji is giving his yoga services free for senior citizens and office people freely through his yoga-meditation workshops and doing this great work of promoting health and peaceful life through his yoga and wellness services and making people healthy in mind-body and soul. He is a lovely noble soul with a lovely golden heart filled with full love, compassion and feelings to help others. He is a true visionary and a silent ambassador hero of love,peace and health who sincerely deserves to be nominated as a public peace prize awardee. He is also a culture ambassador by true sense for providing his unique services of conducting his Yoga-Meditation Retreats for foreign tourists in different famous holy heritage cities of India and sharing his knowledge of Yoga- Meditation, spirituality and our Indian culture & tradition with them. My best wishes for all his future noble services for humanity and mother nature a truly blessed soul. I want to support from the bottom of my heart the nomination of Dharmendra Ratan Singh Sailoni for the Public Peace Prize Award- 2017. He is from Mumbai,India.He is a kind hearted noble soul he is promoting health and peace through his Yoga and Meditation Workshops/Retreats. Public Peace Prize.As I believe his vision is very noble and very helpful for all human race. With lots of love and respect to my teacher. I extend my wholehearted support and all good wishes to Dharmendra Ratan Singh Sailoni of India for Public Peace Prize 2017. My good wishes to Dharmendra Ratan Singh Sailoni of India for Public Peace Prize 2017 and I endorse him from the bottom of my heart for his Yoga and complete wellness efforts. and senior citizens to lead a healthy stress free life . I am Al-Amim from Nigeria and I want to strongly support the nomination of Peace Ambassador Timothy Michael Adepoju for the 2017 Public Peace Prize recognition. I have known him for like four years now working on peace promoting activities. His exemplary life of working towards a peaceful Nigeria is commendable and recommendable. Attached are two photos of his recent activities in promoting peace in Nigeria. I support and Vote David and Renate Jakupca.